Be it opposition to the proposed World Trade Center mosque in New York City or Florida Pastor Terry Jones threatening to burn copies of the Quran, recent news exposed a seeming rise in the mistrust and misunderstanding of Muslims in this country. Observing this trend, what effect would a solid public service campaign have on correcting this skewed image that some Americans have of Islam and Muslims? Would it even be helpful? The United Methodist Church might say yes. The UMC recently launched its “Rethink Church” campaign, which features television commercials, print ads, and an interactive website in an effort to create a modern face for itself. By emphasizing the importance of being racially, socially and even sexually tolerant of others, past campaigns such as “Open Hearts, Open Minds, Open Doors” have also been successful in describing what the modern United Methodist Church stands for. Perhaps taking a cue from these initiatives, several Islamic organizations are beginning to use PSAs to influence public opinion. The Council on American-Islamic Relations, the nation’s largest national Muslim civil rights and advocacy organization, released a series of PSAs to combat rising “Islamophobia” just before the 2010 anniversary of 9/11. One commercial, entitled “9/11 Happened to Us All” features a firefighter from New York City who responded to the attacks. After hearing his emotional testimony, the audience learns he is also a Muslim. Another commercial, entitled “We Have More in Common Than You Think,” features Americans from several different faiths explaining the importance of living in an environment where all belief systems are tolerated. Another organization offers a twist on the classic PSA campaign. My Faith My Voice is a new grass-roots organization that describes itself as a platform for anyone who wants to talk directly to America about issues facing Islam. In addition to providing its own PSA, the website offers what are perhaps the most powerful messages of all: real Muslim-Americans sending in homemade PSAs describing what their faith means to them. While these campaigns have only just begun, they demonstrate an increasing belief that public opinion can in fact be changed. How did they affect you? As a senior PR student, I’m beginning to feel the pressure of transitioning into the workforce. This pressure continues to build as I hear about the growing unemployment rates and terrible economy. The only thing that keeps my spirits up is confidence in my plans for after college. My plan is to move from Alabama to Washington, D.C., to begin a career in public affairs. I came to realize this is my passion after spending the last two summers interning. These internships gave me the chance to see what it is like to be an employee for U.S. Senator Johnny Isakson and a federal agency, the Equal Employment Opportunity Commission. Both of these internships helped me understand that bringing effective PR to politics is where I belong. I am not the only one who found a future job interest through an internship; Molly Webb, a student at The University of Alabama, discovered her interest in fashion PR after a summer internship in New York. Webb interned for ELLE Magazine under creative director Joe Zee, most famous for her role on MTV’s show The City. She always dreamed of working for a fashion editorial. This summer gave Webb the opportunity to see the different sides of ELLE Magazine. She was able to assist at photo shoots, blog for ELLEgirl.com and compose pieces for some of ELLE’s publications. As a photography minor, Webb’s favorite experience was working at photo shoots. “I was able to work at many famous photography studios all around the city and meet some amazing photographers, models and stylists,” Webb said. Emily Spicklemire, a student at Butler University, found her interest in public relations after interning for an agency called BohlsenPR. Not only did interning at an agency give Spicklemire a better understanding of the public relations field in general; it also gave her an idea of what kind of career she wants after graduation. Spicklemire’s favorite experience was being thrown into a completely new environment. Since BohlsenPR was Spicklemire’s first internship, she was able to learn a lot about today’s workforce. I agree with Spicklemire. As a senior, my advice to those entering the college realm is to take advantage of internships. They will help you find out how your talents and passions apply to the field. Lady Gaga: Fashion Faux Pas or Good PR? For anyone who missed the 2010 MTV Video Music Awards this year, I’m sure you heard about the outrageous dress worn by Lady Gaga when she accepted her award for video of the year. From a distance the garment appeared to be a red cocktail dress, but up close viewers could see that this dress was made completely out of raw meat. This comes as no surprise to Gaga fans considering Lady Gaga is known for wearing outlandish ensembles to award shows, but I’m not sure that even Gaga expected the media attention this dress would receive. Personally, I view the dress as a guerilla-marketing tactic that is being used to draw people’s attention to a cause. Lady Gaga claims that the dress was worn in protest of how homosexuals are discriminated against by the U.S. military. In an interview with Ellen DeGeneres, Lady Gaga said if we don’t stand up for what we believe in then “we’re going to have as much rights as the meat on our own bones. And, I am not a piece of meat.” The dress may have made a point, but did Lady Gaga lose fans? However, Lady Gaga’s fans expect her to wear crazy and inventive couture. Though the dress was offensive to some, the press received by this dress has become quite the topic of conversation, and all of Lady Gaga’s “little monsters” are sure to forgive in time. In PR, we are always looking for new and inventive ways to get the word out about organizations or causes we may be representing at the time. From my standpoint, I think Lady Gaga got exactly what she wanted, which is for gay rights in the military to be recognized and fought for by Americans. She might have gone a little overboard, but she got people talking and that is how a good PR campaign gets started. 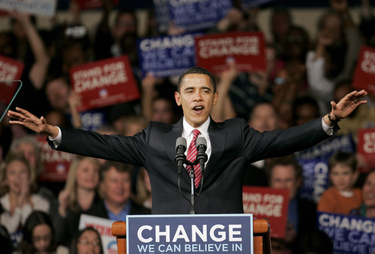 At the 2004 Democratic National Convention, I watched as Barack Obama addressed the nation for the first time on behalf of John Kerry. He had a palpable charisma and intelligence that got people talking—this could be the first black president someday. Someday came only four years later. One of the key components to President Barack Obama’s campaign success was his ability to communicate and inspire the American people. He reached out on a level that citizens had grown unaccustomed to in recent years. His energy and wit made it obvious that he was an effective communicator and had fun while doing it. This background makes it odd that one of the main complaints of Obama’s presidency is the lack of communication and information coming from the White House. While facts tend to be shared, there appears to be a deficit of empathy, and the president has been described as ineffective and passive. What happened? Did the American people and the press fall out of love with the idol they built Obama up to be? Tina Brown, co-founder of The Daily Beast, shared her opinion on CNN’s Sept. 19 edition of Reliable Sources. She argued Obama had nowhere to go but down. The media idolized him throughout the campaign process and created an image that would be hard for anyone to live up to. “What I haven’t always been successful at doing is breaking through the noise and speaking directly to the American people in a way that during the campaign you could do,” Obama told ABC’s George Stephanopoulos, as cited in the article. The White House took strides to expand its reach to the public by embracing new realms of social media such as Facebook and Twitter. White House Press Secretary Robert Gibbs even uses his own Twitter account to get an unfiltered voice out. Not one of these avenues seems to give the people what they want: a direct relationship with their president. It is not as though this relationship existed with past presidents and Obama stripped the public of that. Contrarily, I believe the American people painted an unattainable picture of Obama during the campaign; he no longer has the capability to reach out on a daily basis. You won’t find him at your local diner shaking hands or see shots on the evening news of him playing basketball with his friends. This results in a less romanticized image, and I think people are simply disappointed that Obama is a normal human being learning one day at a time how to handle being the leader of the free world. This does not mean, however, that Obama does not need to make himself more accessible and empathetic with the American people. This goal can be accomplished through simple changes in wording and the way he presents his statements. The president has no choice but to change his presentation and start making heart arguments rather than head arguments. By touching people’s hearts, he will slowly start making his way back into them, too. Are Internships a Win-Win Situation? As a child, summertime meant signing up for camps, going to the pool and relaxing with friends. The only thing that really needed to be accomplished was summer reading. In college, summer takes on a whole different meaning. Students compete to see how much they can cram into their three months of time off. Some students use the time to take classes. Others use it to work and save up for the school year ahead. For me, the last two summers have been filled with internships. I am a true believer in the internship experience. The things I learned within these short periods of time helped me and my portfolio grow. As you can imagine, I found it very discouraging when I read an editorial about how interns aren’t worth the time the employer uses to train them. I completely disagree with this position. Although interns might take some time to manage, they are able to contribute to the office in a number of ways. Instead of talking about my own experience, however, I decided to talk to some other individuals to see what they got out of their summer internships. Lizzie Powell, a student at The University of Georgia, interned in the Public Relations Department of the Georgia Aquarium this summer. Powell found out about the internship at a PRSSA conference in Atlanta when she met Meghann Gibbsons, the director of public relations for the Aquarium. Throughout the summer, Powell gained experience by writing press releases, strategy sheets, social media posts, e-newsletter content and calendar listings. For Powell, the most rewarding experience was seeing her work succeed. This past winter, the Georgia Aquarium rescued four cold-stunned sea turtles. Once they were rehabilitated, Georgia Aquarium partnered with the Georgia Sea Turtle Center to release the sea turtles in Jekyll Island, Ga.
For Karissa Bursch, a student at The University of Alabama, her summer internship sent her to Barcelona, Spain. Bursch is majoring in both public relations and Spanish, so landing an internship in Barcelona was a dream come true. Bursch interned for a PR agency called DcorporateCom, and her main responsibility was international development. As a Spanish company, DcorporateCom was interested in gaining some American clients. Therefore, Bursch was a huge asset to the office, since she speaks both languages and has extensive knowledge about American culture. Bursch spent a lot of time translating Spanish documents to English. Although a few employees in the office spoke English, they did not know how to appropriately use the language in certain situations. For example, the Spanish language becomes more formal and decorative in press releases. In English, press releases are fact-based and straightforward. Therefore, Bursch had to find the perfect middle ground. For Bursch, the best part of the internship was learning how to use communication in a different setting. Powell and Bursch had very different experiences this summer, but both gained knowledge that will help them succeed in the future. I think it’s safe to say that the internship experience was a summer well spent for both them and their employers. “The man your man could smell like” is now the man you see everywhere. 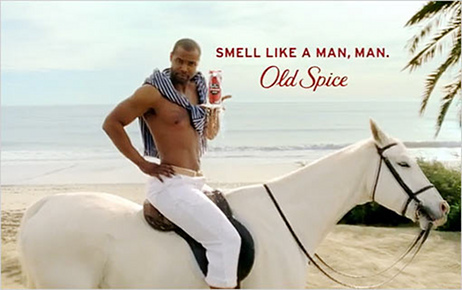 Isaiah Mustafa, also known as the Old Spice Guy, took over TVs this summer from The Today Show to The Emmys, where he won the award for Outstanding Commercial. He’s been busy entertaining fans with his cool confidence while carrying the entire Old Spice brand on a single persona. These funny commercials aren’t all that’s launched Old Spice and Mustafa into the public eye, so what is it exactly that has all of America talking? The commercials are part of a well-placed social media campaign paired with the original advertising campaign. Old Spice utilized YouTube, Twitter and Facebook to make personal connections with the fans of Old Spice Guy. Followers everywhere watched while Mustafa stayed in character for a week at the studio, where he filmed personalized video responses to tweets on his Twitter account. He kept people entertained by doing everything over the top, from flirting with actress Alyssa Milano to proposing to a fan’s girlfriend on his behalf. This online presence took Mustafa and the brand off the TV screen and into the lives of his fans, giving people a chance to interact with him and form a personal connection. The campaign was a brilliant move for the Procter & Gamble brand; it generated media coverage everywhere. Even people that don’t tweet shared the videos, forwarding them to friends on Facebook. Several of the responses went viral from word of mouth, and Old Spice’s YouTube account boasts more than a million views for almost every video response. P&G isn’t the only company finding success by building its brand around a persona. Dos Equis’ The Most Interesting Man in the World and Keystone Light’s Keith Stone are other brand personas using humor and wit to connect people to the brand and help sell their products. While Dos Equis and Keystone Light have not exploded into the world of social media the way Old Spice Guy did, the opportunities for these personas to develop are endless. Keith Stone already has a Facebook page, and The Most Interesting Man in the World has a website devoted to his most famous quotes. these brand characters will develop.